The main dining room at The Ranche Restaurant in Fish Creek Provincial Park is rustic, the roof is supported by huge wooden rafters and dominated by a welcoming fireplace on the west side. The decor reflects its heritage as an authentic ranch house, owned, at different times, by William Roper Hull, who built it in 1896 and by Senator Patrick Burns, both ranchers in the area in the late 1800’s and early 1900’s. history. 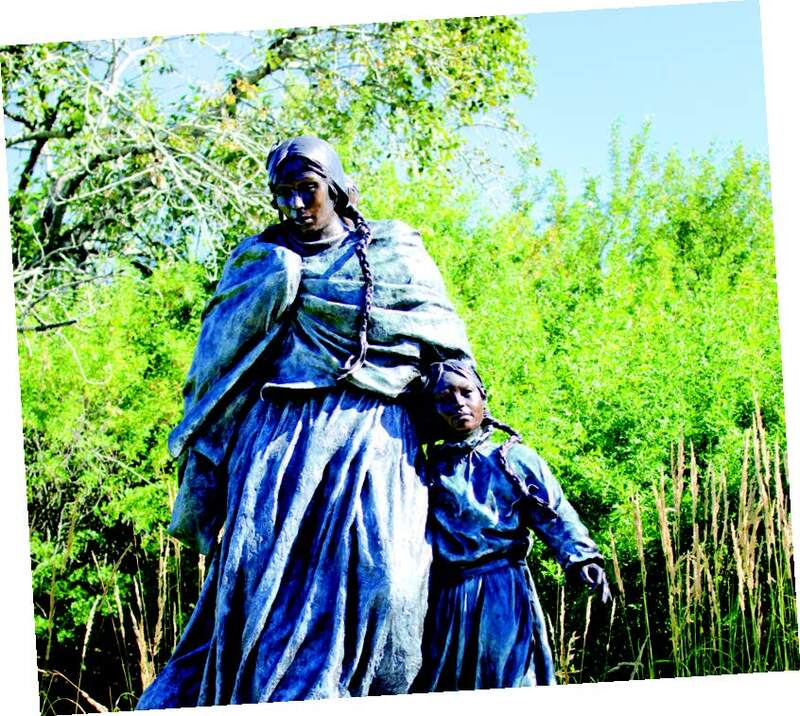 They founded the Ranche at Fish Creek Restoration Society in 1995. By 2000, with the restoration complete, the house was leased to a commercial operator and opened as The Ranche Restaurant, fine dining restaurant. To the west of The Ranche Restaurant is Annie’s Bakery Cafe, where home-baked goodies are available for hungry cyclists and hikers. In the 1880’s the building was home to the manager of the Hull Ranche, William (Bill) Bannister, and his young bride, Annie Birney. The area between these two buildings, is where the Native Gardens are located, a two hectare space that features re-introduced native species plants, trees and grasses. Nestled in the north-west corner is the Artisan Gardens that honours the First Nations people who initially lived in the area. Today, as she sips some herbal tea, Mitzie looks serene and comfortable. She, her husband Larry, as well as countless volunteers, have accomplished what many said couldn’t be done. “The volunteers are key”, says Mitzie. “They maintain the gardens, paint, and do whatever needs to be done”. However, Mitzie’s serene demeanour is only temporary. The new project, The Branded Patio and The Artisan Gardens has its grand opening on June 23rd, 2013. The Branded Patio commemorates the ranchers and farmers who lived and worked here until the 1970’s. Their brands are featured on hand-crafted mosaic stones with an additional 80 stones available for individuals and families. Sponsors are encouraged to help in the design of yourr own mosaic, illustrating events or people from your history or your personal ties to the park. Visitors are immediately engaged in the family stories of triumph and tragedy being told here. We celebrate their history as we move from one stepping stone to the next. The Artisan Gardens features an amphitheatre-like setting of twelve arrow-head style benches. Each bench houses six original art works. There are also three life-sized bronzes; two bronze busts and a full-size wood carving of a wolf. The artists were selected by a panel and represent a broad swath of individuals, styles and media, from First Nations artists such as Dennis Weber, Rocky Barstad, Neepin Auger and Roland Rollinmud to sculptor/painter, Vilem Zach and Jeff de Boer, who created a brushed stainless steel Teepee placed at the centre of the area. Artists such as Robert Bateman, Paul Van Ginkel, Derek Besant, Jason Gogo and many more have represented the landscape, nature and history of the Park. Many artists who have long had an association and appreciation for the area have expressed themselves in paintings, glass, mixed media, plaster relief, photography and stone mosaic. You arrive at Fish Creek Provincial Park via Bow Bottom Trail in SE Calgary. As the road narrows, turn right at the sign for the Ranche. Walk past The Ranche Restaurant, along the historical walkway, lined with hand-wrought gas lampposts and hand carved stone benches. Welcomed by a grouping of seven bronze fish and an inviting gazebo, you are startled to see all of this art outside, until you realize that this is an organic expression of what was already here. The Artisan Gardens is so much more than an outside art gallery. As Mitzie explains it, “The Gardens also represents a direction for the future. It provides us an opportunity to contribute to the legacy of the land through art. Through the volunteers (more than 3700 hours were logged in the past year alone!) and the sponsors of the art, people feel a sense of ownership, of pride. Some volunteers name their “patch” and for the moment, they “own” the land and connect to its history. Others demonstrate a sense of stewardship by sponsoring an art piece to which they have become attached. impact us in the future. Groups of students, from elementary to post-graduate levels, will learn about the typography, flora and fauna of the Fish Creek Valley. Somehow you know that this is what Premier Peter Lougheed envisioned in 1973 when he set aside this area in the middle of Calgary, following the meandering Fish Creek, named for the Bull Trout that are indigenous to this body of water. 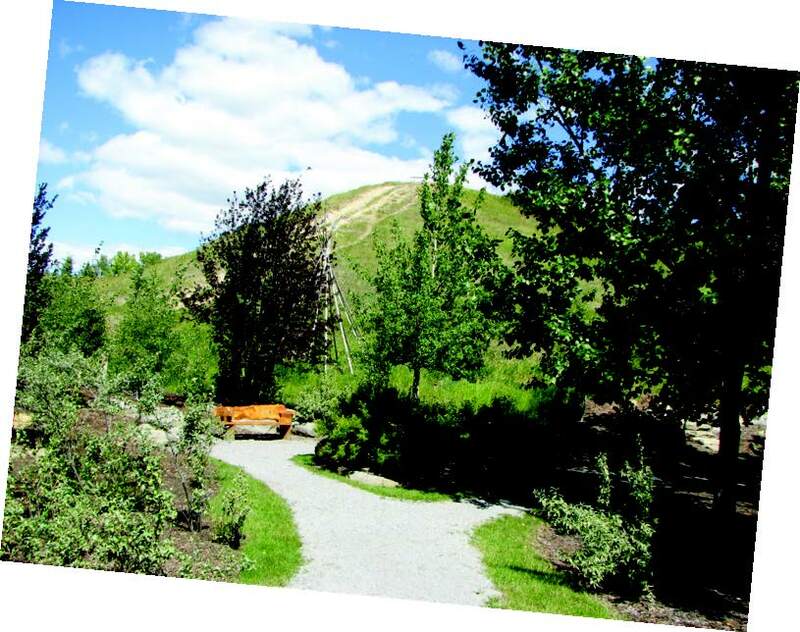 The Artisan Gardens offers not only a respite from the city but a chance to learn about environmental stewardship as well. Whether you set out to explore caves, snowshoe, search for fossils or simply take a walk, the Ranche offers a wide range of terrains to discover. 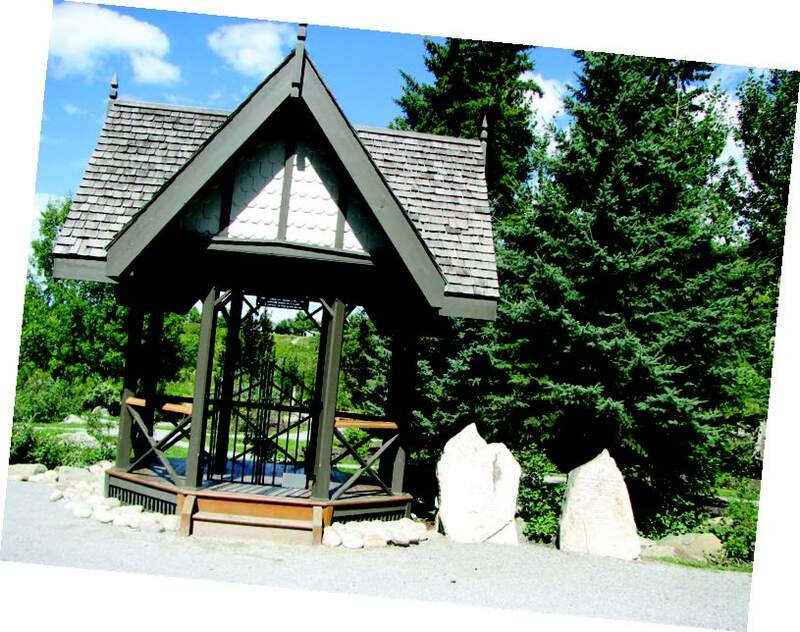 It is an ideal location to either begin or end your visit to Fish Creek Provincial Park. It is a journey to the past and a signpost to the sustainability of the area. In the end we are all beneficiaries of a legacy that was passed on to us. We owe ourselves and future generations this opportunity at stewardship – a chance to preserve the past. If you would like to participate in the stewardship of The Ranche at Fish Creek by sponsoring a piece of art, contact Mitzie at info@bowvalleyranche.com or go to the website to learn more at bowvalleyranche.com. • The 2-storey brick mansion, known as the Bow Valley Ranche was built by William Roper Hull in 1896.
and hosted lavish social gatherings, extravagant dinners, polo, tennis and fox hunting. • Today, The Ranche is one of Calgary’s top restaurants and a popular spot for wedding receptions.